CHILDREN launched 250 balloons to mark the official launch of Frome Vale Academy in Downend. 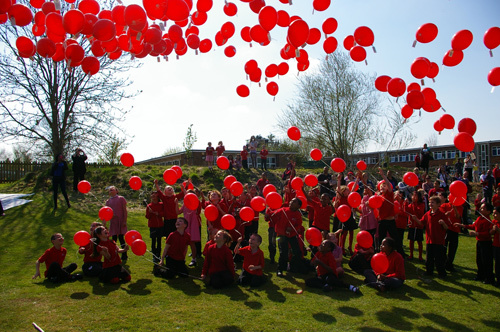 The red balloons carried messages from the primary school pupils about their hopes and aspirations. The former Oldbury Court School in Frenchay Road is now part of the Cabot Learning Federation. Staff and pupils staged a party to celebrate becoming an academy and starting the next stage on the school’s journey. Activities on a glorious afternoon included music, maypole dancing, sports displays and donkey rides. Parents and members of the local community joined in.